As jockey Corey Nakatani recovers from a summer spill, his son and agent Matt Nakatani is helping recent West Coat arrival Angel Cruz gear up for Del Mar’s Fall Racing Festival, which opens Friday. The younger Nakatani, 26, grew up watching his dad race first in California and then in the Midwest and along the East Coast. 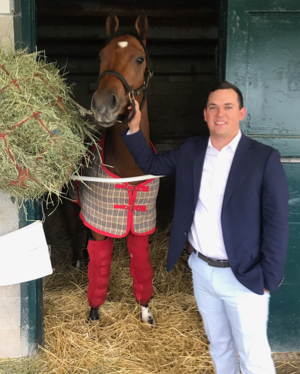 After moving to Kentucky, Nakatani played football at Shelby County High School, and while his dad rode under the Twin Spires at Churchill Downs, Nakatani set his eyes on another venue nearby. From the Churchill Downs’ grandstand, it is impossible to miss Cardinal Stadium, home to the University of Louisville’s football team. And that is where Nakatani found himself in college, playing kicker while studying communications, business and sports administration. Nakatani graduated in 2014 and moved back to California the next year. While waiting a year to re-establish in-state residency before applying to law school, his dad took a break from riding at the end of March 2016 to help his wife through sickness. As things resolved themselves, thoughts of returning to the saddle occurred. Corey Nakatani made the decision to ride again, but wanted to remain on the West Coast to be near family. It was a moment where he was in need of an agent, and his son thought of a different way he could apply his sports administration background. His dad told him it was an up and down game, but if he was interested, talk to trainers at the track and see what they had to say. They wanted to ride Corey Nakatani again, and so father and son teamed up to win a stakes race the first week back. Things picked up in 2017 when the jockey hopped aboard Bolt d’Oro, who won two Grade 1s in the Del Mar Futurity and the FrontRunner Stakes. The good fortune continued into three graded stakes in 2018, including a victory aboard Bowies Hero in the Grade 1 Frank E. Kilroe Mile. Nakatani was used to the highs and lows in his football days. He played under Coach Charlie Strong, who was new when Nakatani joined the team. In 2013, the Cardinals made it to the Sugar Bowl as the major underdog to Florida. The final score? Louisville: 33. Florida: 23. Things changed on the track when Corey Nakatani was injured in a spill Aug. 4 at Del Mar. He was aboard Irish Spring, who clipped heels with a drifting horse and fell. Irish Spring did not survive the injuries, and his rider was left with a herniated disk and a T7 spinal fracture. Nakatani said his dad still has good days and bad days. There is no timeline on a full recovery. With his dad taking the time to recover, Nakatani was an agent without a jockey. That is, until East Coast-based Angel Cruz contacted him about moving his tack to Southern California. Cruz grew up in Puetro Rico, where he learned to ride alongside Eclipse Award-winner Jose Ortiz and his brother, Irad Ortiz Jr. He was the leading rider at Aqueduct’s 2015 spring meet and a 2014 finalist for the Apprentice Jockey Eclipse Award. Cruz, a frequent rider in Maryland, notched his first Grade 1 when he traveled to Keeneland for trainer Graham Motion and won the 2016 Alcibiades Stakes aboard Dancing Rags. The victory sent him to that year’s Breeders’ Cup Juvenile Fillies at Santa Anita Park. Cruz fell in love with California and made the move in the middle of October this year. 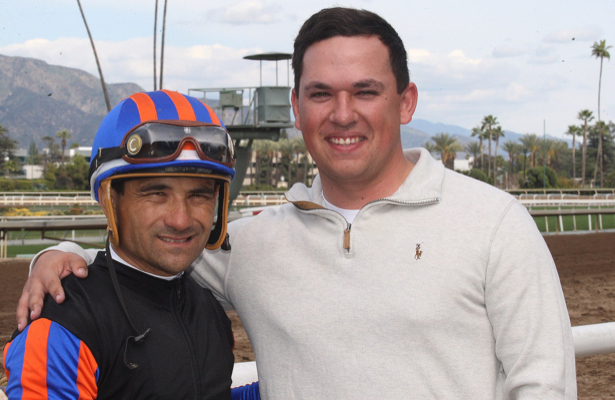 Success for the new jockey and agent pair came in Cruz’s second ride since moving to Southern California. Cruz piloted The Hunted to a maiden special weight victory Oct. 27 for trainer Richard Baltas. The jockey also had multiple mounts lined up each of the last three days during Santa Anita’s closing weekend. Nakatani is waiting on his dad to reach 100 percent health before a decision is made on a future riding career. Even without a set date, the father-son duo is wanting to tackle more big races together. Until then, Nakatani will continue to dedicate himself to finding rides and making connections with Cruz.